This tissue culture sport of H. 'Candy Hearts' was originated by Steve Moldovan of Moldovan Gardens in Ohio and registered by Peter and Jean Ruh of Ohio in 2008. The plant grows into a medium size hosta about 15 inches in height and 3 feet wide with a somewhat unruly nature. Its leaves are ovate shaped and have thick substance. Pale lavender flowers bloom in July. 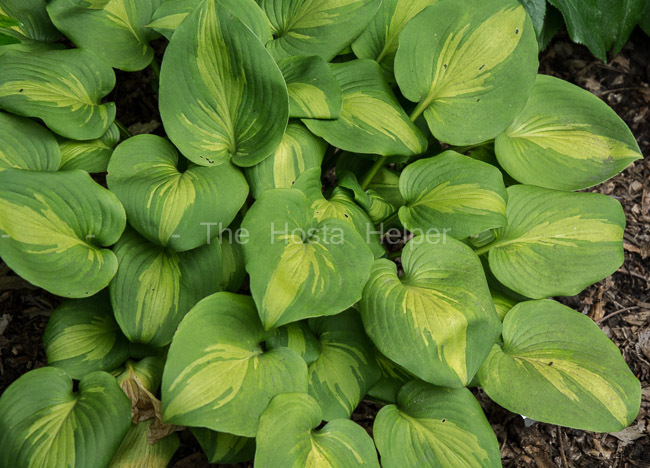 The New Encyclopedia of Hostas by Diana Grenfell (2009) states: "Increases rapidly...Divide regularly to maintain the width of the variegation...Probably the first hosta to have a muted butterscotch-yellow central variegation (at its best it is in the "hand print" pattern), but quite random in width." Similar hostas include H. 'Tomahawk'.